Preschool worksheets for pre-k children. Worksheets for Left and Right directional concept. Free printable worksheets for kids. Swimming fish worksheet. New! 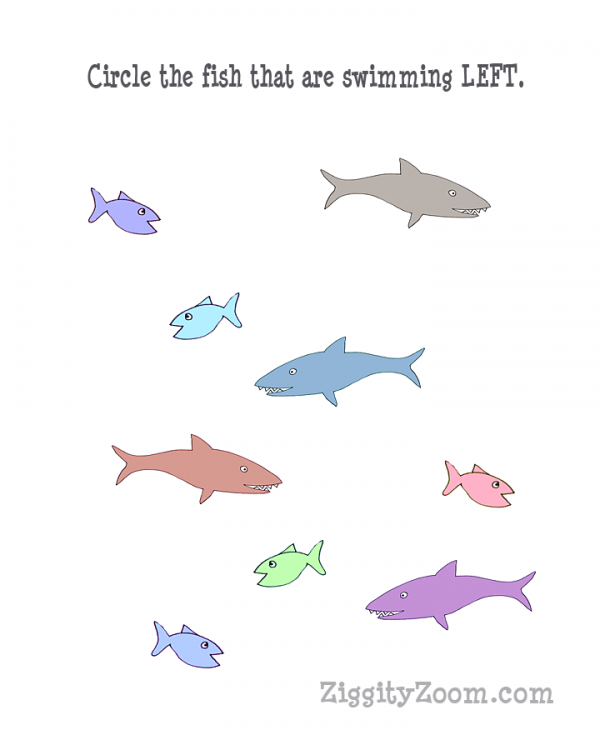 Print this directional concept for LEFT for kids to circle all fish swimming in a left direction. Preschool printable worksheet. Also see the RIGHT directional worksheet. To Print- Click the Image above or click here to print the Left Directional Shark worksheet for Preschool or Kindergarten. Then select the page to print (ex page 2 only) you do not need to print the directions or url page. Kids love the fun shark images for this Left Directional worksheet.